Knowing the ownership structure of the company is one of the first things an entrepreneur/investor should look at when starting/investing in a business. Capitalisation table, or simply cap table, is the one that lists all such details, i.e. the details of the shareholdings as to who owns and how much stake in the company. Investors ask for the cap table as soon as they find a company interesting because they need to understand the key people in the firm and the control structure. Being able to immediately provide a clear table builds confidence and trust, whereas a poor shareholder structure could jeopardise your chances. “Entrepreneurs think they know their cap table but time and time again, I have found many mistakes in cap tables. Here entrepreneurs are the ones losing out. You know what, Goldman Sachs made a US$100-million mistake due to a faulty cap table in 2014,” he tells e27. Cornu’s years of efforts to create a cap table with some unique features has finally paid off. He claims the Future Flow cap table template is far better than all the competitors in the market, including Google Spreadsheets. “Our cap table template is built to allow quick and simple inputs by users, yet generates powerful, useful, insightful outputs. As a native Google Sheets file, you can access it wherever you go, you will not struggle with outdated file versions, and you can share it with your co-founders in a link. The visibility that Future Flow’s cap table template gives allows for better funding decisions. I worked on this for more than two years and made a simple and free cap table template to help create stronger entrepreneurs and more successful businesses in Southeast Asia,” he says. Cornu, a French by birth, started off his journey as a fund manager. He came to Singapore in 2010 and built his own startups and also advised other entrepreneurs along their growth journey. Throughout his journey, he has helped many businesses keep the proper track of their shareholders and maintain a clean cap table, he notes. “As an entrepreneur, you want to focus on the vision and not get bogged down on the paperwork and other operations details. This is where Future Flow’s cap table assumes significance. It combines the basic information with powerful insights — once you input the shares and investments received, it generates clear dashboards, including charts of price per share and valuation trend, as well as dilution over time. It also calculates the Return on Investment of every investor,” he boasts. 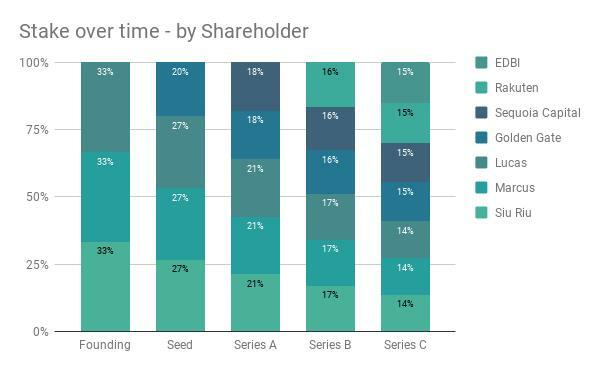 “Beginners use our cap table to be guided on the process, whereas late-stage entrepreneurs use it to monitor the evolution of their stake and the dilution they face,” Cornu explains. Valuation over time: Both per share and total company valuation, on a per round basis as well as time adjusted. Dilution: Visual of dilution over time, by shareholder profiles, series and shareholders. One pager summary: Including table of shareholders’ stake (with and without ESOPs), value of stake, and pie charts of ownership. A simple dropdown allows you to go back in time and see the summary at any step of the business. Unlimited rounds and transactions: The template is flexible to add rounds as you need. Up to 25 shareholders: It can be extended for more. Multiple class of shares: Monitor your cap table through three dimensions, class of shares, shareholder profiles and funding series. When calculations are not automated, you can input the results of calculations done aside. A Google Sheet file, Future Flow’s cap table template is good for those who love working on the cloud and it can share easily with co-founders and partners. “Our cap table template is useful for any entrepreneurs starting a company and growing it. We made it to cover up to 25 shareholders. Since it’s a spreadsheet, it can be expanded along a company’s growth,” according to Cornu. It is not just founders/entrepreneurs whom Future Flow targets with its cap table, but accelerators are also using this tool to make their startups more investable. According to Cornu, the cap table helps them in cleaning operational and financial issues. A dozen entrepreneurs are already using Future Flow’s cap table, Cornu claims. But why is it provided free of cost? “I’m glad about all the support I have received since my arrival in Southeast Asia eight years ago, and I believe that the growth of the ecosystem benefits all of us. Helping create better companies that creative positive impact on the world is my goal. At Future Flow, we want all entrepreneurs to understand their business financials. We want to bridge the gap between entrepreneurial and financial skills — to make finance more accessible and easy to understand. When companies grow, we get more opportunity to work with them on strategic topics,” Cornu remarks. “My experience of publishing free tools is that it really benefits the ecosystem. For example, Bank2Xero helps hundreds of businesses import their bank statements to Xero (when bank feeds are not available), and Map of the Money which I co-founded is a website for entrepreneurs to connect with investors,” says Cornu. The post Future Flow’s cap table helps founders easily monitor the evolution of their stake, equity dilution appeared first on e27.